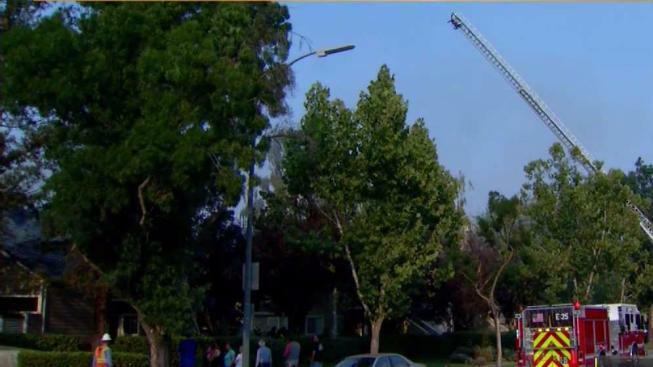 Firefighters responded to an apartment blaze in South San Jose that quickly became a two-alarm fire thanks to the Bay Area heat wave. The fire was reported in the area of Coleman Road and Winfield Boulevard, near Almaden Lake Park. The fire damaged six units, displacing 8 adult residents. The cause of fire is still undetermined. Extra fire crews were on the scene to knock down the flames and help manage fire fighters exposure to the high temperatures. “Because of the heat today, one of the things that we do is that we’re going to try to bring a lot of people to the fire, just because we need to rotate bodies,” said San Jose Fire Captain, Brad Cloutier. As a precaution, a fire fighter support unit run by the Santa Clara Fire Associates was set up as a rehab space with plenty to drink. Onsite, paramedics were also distributing cooling packs. Since the heat wave is expected to last a few more days, the Santa Clara Fire Associates will be on call to help fire departments across the county. Alameda County fire crews will also be calling out hydration teams to help their crews manage the heat exposure.